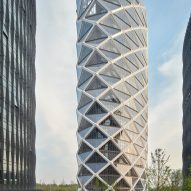 The tallest of three office towers that Skidmore Owings & Merrill has completed in Beijing features a faceted exoskeleton, inspired by the patterns created by the folds on paper lanterns. 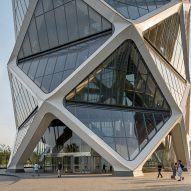 The concertinaed external layer of the main tower of SOM's Poly International Plaza creates a thermal envelope around office spaces, which are enclosed in a second layer of interior glazing. The footprints of the 31-storey block and the two supporting towers on either side are an unusual elliptical shape. 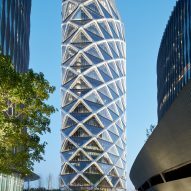 The curves mark the office towers out from the strict geometry of the surrounding buildings. The offices were erected in a new business district midway between Beijing Capital Airport and the Forbidden City. There is a gap between the honeycomb formation of the exoskeleton and the interior spaces, allowing air to circulate as well as creating a sense of visual connection between the floors. It also creates a heady space for the atrium to sit in at the base. "As we honed in on the notion of an elliptical form that would fit comfortably with the conflicting geometries of the site and as we began to address the structural needs of the form, we also recalled the traditional symbolic significance of a lantern hung outside a door as a sign of welcome and attracting good fortune," design partner Leo Chow, told Dezeen. "That seemed particularly appropriate for this site directly adjacent to the Capitol Airport Expressway and all the travellers arriving into Beijing from the airport," Chow added. 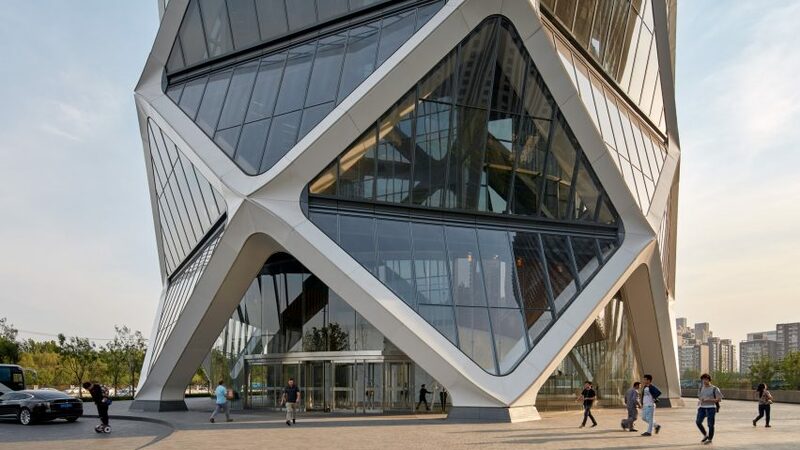 "Interestingly, when someone on the team folded a piece of paper to describe the geometry of the building we discovered that it naturally sought to create the faceted surface of the final design. So we knew the idea had the ability to resonate both structurally as well as symbolically." 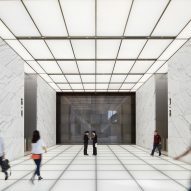 The San Francisco-based architects used a long-spanning structural elements to create daylight-filled and column-free office spaces. 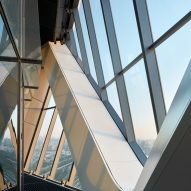 The abundant glazing of the facade gives workers views out to the undulating parks and pathways surrounding the Poly International Plaza, which cover steps and an underground carpark. SOM champions elegant feats of engineering and in a recent pop-up exhibition to coincide with the Chicago Architecture Biennial the first displayed sale models of 30 of its skyscrapers stripped back to their cores to show the architecture in the engineering. The architectural, urban planning, and engineering firm ranks at 119 on the Dezeen Hot List, a ranked guide to the most talked about figures in the industry. Recently SOM won a competition to redesign the entire skyline for the port city of Colombo in Sri Lanka. The firm also revealed its designs for a 16-hectare 'vertical village' in Bangkok, Thailand, that will host residential, retail, hotel and office space for an estimated 60,000 people.